AT the top of every gardener’s wish list is a bountiful barrel of potbellied tomatoes – one of the great vine-ripened delights of summer. Botanically speaking, these glistening orbs (be they red, orange, yellow, green, purple or brown) are fruits, but their subtly sweet flavor makes them less of a dessert feature and more of a qualified companion to the mild acidity or bitterness that can be found in sauces, salads and sandwiches. The average grocery store variety (which has likely been picked green and ripened away from the vine) poses no competition to the taste, texture and aroma of a vine-ripened tomato. Tomatoes are at their most succulent during June and through September. Seasons of growth: Tomatoes are warm season plants which require very warm temperatures in order to produce and ripen fruit. Frost tolerance: This plant requires warm air and soil temperatures, and should be planted after all danger of frost has passed. Tomatoes have no tolerance for frost. Plant Spacing: Place seeds 18 inches apart and transplants 2 feet apart in the row. Rows should be 2-3 feet from one another. Germination Requirements: Ideal temperatures for germination are 70-80°F; seeds generally germinate in 5-10 days. Best establishment method: Tomato plants can be established using either seed or transplant. Direct seeding in the garden should only be used in areas with extremely long growing seasons similar to those regions that are in USDA Hardiness Zone 9 or higher. However, the warmest segments of the season may reduce fruit set. The best method is to use 4-8 week old transplants that you have grown yourself or purchased from a reliable garden center. Move tomato transplants outdoors when they have 5-7 leaves, are between 6-10 inches tall, and are both stocky and dark green. If transplants are already flowering or producing fruit, they may be slow to establish or yield poorly. Any flowers or small fruit should be pinched off and discarded prior to planting. To implement this method, dig a shallow trench 6-8 inches long. The trench should slope from the surface at one end down to 4-6 inches at the other end. Lay the root mass in the deep end, cover the roots with soil, and gently cover the stem until the entire trench is filled in. Remember to remove the lower set of leaves that would otherwise be covered by soil in the trench. Your plant will be leaning sideways after this step but it will straighten itself within a few days as it responds to gravity and sunlight. This planting method is great for transplants that have become excessively tall and weak. New roots will form along the newly buried stem providing for quicker establishment and nutrient uptake. As a final note, if your plants are tall and “leggy” and you know you should bury them deeper, always rely on the trench method. Simply digging the hole straight down will likely put the root mass into undesirable cooler soil temperatures. This will, of course, cause your tomatoes to get off to a slow start as the soil eventually warms to a suitable temperature for root growth. 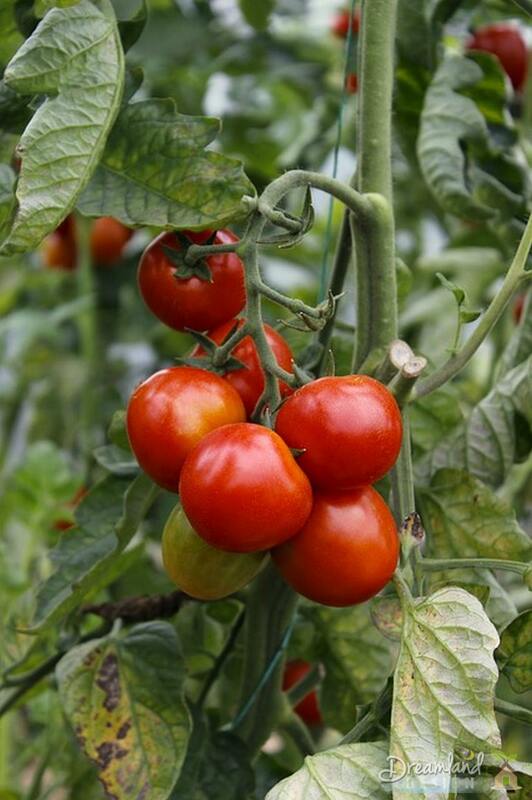 Days to Harvest: From flowering, tomatoes will reach full maturity in about 45-75 days depending on the variety. For optimum flavor and quality, remove tomatoes after they have reached full color but remain firm. Remove tomatoes as they ripen and harvest even the immature fruits (those that are green or only slightly colored) at the end of the season before a forcasted frost event occurs. Most of these will continue to ripen when stored in a dark, cool area such as a basement. 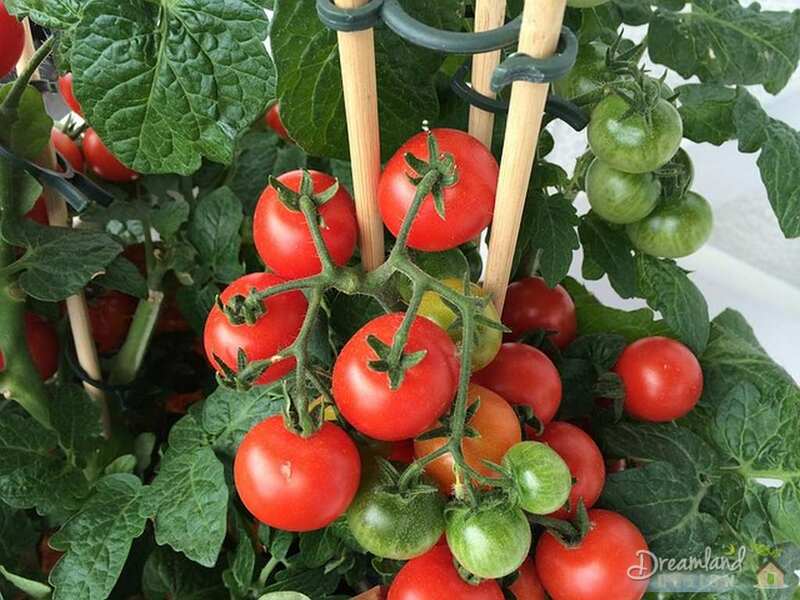 Water Requirements: Tomatoes require deep, infrequent watering of about 1 inch weekly and increasing to 2-4 inches per week later in the season. Irrigate so that water sinks deep into the soil, but be careful not to overwater. Blossom-end rot, which causes a dark, leathery spot on the fruit, can be caused by both over or under-watering. 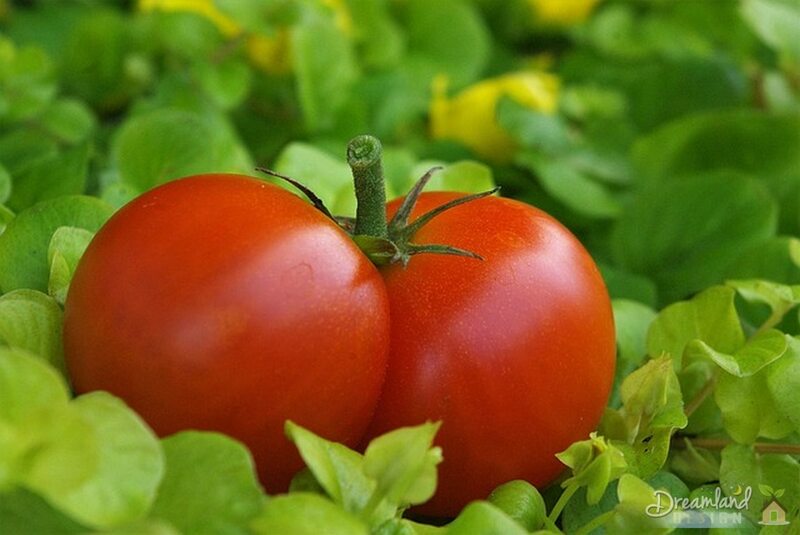 In addition, overwatering when fruit are ripening will lead to cracked, or split, tomatoes. Fertilization Requirements and Recommendations: Heavy fertilizing may cause delayed flowering and should be avoided. An initial 6 inches of compost worked into the soil prior to planting will suffice for the first 6 weeks of growth. At 6 and 8 weeks after transplanting, side-dress each plant with ½ tablespoon of nitrogen-based fertilizer, such as ammonium sulfate (21-0-0). Water well after feeding to move the material into the root zone. Alternatively, additions of 2 inches of compost at 6 and 8 weeks after planting (gently worked into the soil around each plant and watered well) will maintain an organic approach. Diseases and control: Tomatoes may suffer from leaf blights or spots, various wilt diseases, viruses and fruit disorders such as blossom-end rot, cat-facing or sunscald. Dark spots on the stems, leaves or fruit may indicate leaf blights, a disease which can cause excessive damage to foliage, overexposing fruits to the sun. Do not use overhead irrigation late in the day to avoid the cool, wet conditions in which leaf blights flourish. Wilt diseases may cause leaves to wilt or plants to die. Look for streaking, slime formations or gummy exudates on or in stems. Always look for varieties that are resistant to various diseases. These attributes can be found after the plant name on a label in the form of capital letter strings like VFFNT. Heirloom tomato varieties typically do not have much resistant and therefore should be planted with the expectation of lower yields. Viruses may cause leaves to be twisted, curled or otherwise malformed. Fruit flavor will be affected by early infection. One way to control viruses is to first control pests, such as aphids, that act as carriers and transmitters of many viruses. It is also a good idea to destroy any infected plants via burning or by adding them to your garbage container. Never put these plants in your compost pile as some virus forms can survive the heat generated in decomposition. Fruit disorders can be controlled through good nutrient and water management and the use of tomato cages or other support structures. Avoid planting too early in the season and further prevent fruit disorders by ensuring that plants are exposed to warm weather and moist soils. Insects and control: Aphids, flea beetles, hornworms, whiteflies, spider mites, and fruit worms are the common enemies of the tomato plant and its fruit. Dislodge aphids, whiteflies, and spider mites with a strong stream of water and treat with insecticidal soaps or properly labeled insecticides. Control flea beetles with organic or chemical insecticides. Worms should be removed by hand and further treated with the appropriate insecticides like Sevin or biological measures. Note: Always follow label instructions closely when using any chemical pesticide for best results and for your own safety.